Fire and EMS departments have traditionally lagged Police in terms of adoption of mobile data, but that’s changing – fast. Symposium has been at the forefront of delivering sophisticated mobile data capability to Fire and EMS departments for many years, and thanks to close working relationships our clients are now at the forefront of mobile adoption and capability. One such department is Niagara Falls Fire Department. 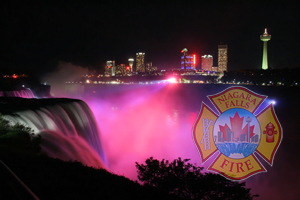 A longstanding Symposium client, Niagara Falls utilizes our CAD, EMMobile, EMLive, and RMS interface to maximize situational awareness and response capability. Recently we spoke to NFFD Communications Captain Dave Evans about some of the impacts mobile data capability has had on the Department’s operations. Symposium: How would you say the system has changed/improved the emergency response process? Can you contrast this to how things were done before? Dave Evans: I think that since the EMMobile gives us a pre-alert tone, our assembly times have improved slightly. The computer is more of an extra tool to be used for mapping purposes, and the “Take to Event” display is of assistance for routing to calls. Symposium: Are there any functionalities that stand out in terms of being particularly useful and effective? Dave Evans: We use the internal messaging quite a bit. The ability to track vehicles in the CAD is a great ability, which we use on every call to tell when the vehicle is almost at scene, on scene, etc. Access to the RMS info is being used by officers. Symposium: Can you think of an incident wherein the mobile capability was particularly effective in enhancing the response? Can you provide some details? Dave Evans: The Platoon Chief was able to use the tracking ability in the EMMobile to locate exactly where an incident (MVC) was on a main street, and plan his route there accordingly. Symposium: Some other departments have noted that bringing the EM Mobile online has reduced radio traffic substantially. Have you found this to be the case at Niagara Falls Fire? Dave Evans: We do have a new policy out that is meant to limit the radio transmissions to a bare minimum at the start of an incident. I have noticed, so far, a slight decrease in radio traffic, and again I believe this should show more of a decrease as officers become more familiar with the system. Symposium: Moving on to a different topic, Niagara Falls Fire also has its CAD interfaced with an automated incident Twitter feed. How have these capabilities affected operations? Dave Evans: The twitter feed link we have on the city web site has hundreds of followers. We also utilize a “private” twitter feed that Symposium has set up which is used on a daily basis by senior officers and on-call personnel. This twitter feed has decreased significantly the amount of phone calls coming into the alarm room. We’d like to thank Dave Evans for taking the time to talk about the department’s experience, and for lending his insight and expertise. To find out more about how mobile data can help your department respond faster, safer, and more effectively, please feel free to contact us at info@symposiumtechnologies.com.